There is nothing that melts our hearts more than a romantic First Look between a soon-to-be husband and wife. It adds to the joy and romance of the day, and makes for the sweetest memories! We absolutely adore how more and more couples are choosing to share this once unthought-of moment. Here are some of our favorite First Looks that have happened throughout the property. One of our favorite spots to share a First Look is on our front steps. daisy and ross took a break before the day’s festivities to privately read their vows to each other in a relaxed, gorgeously intimate way. Couples that want to save the magic of the garden for their ceremony often choose a spot in our historic house for a First Look. Brittany and Chris had a classic hand-holding moment where neither bride nor groom could see each other just yet. After their First Look, Brittany and Chris exchanged personal vows and some sweetly happy tears! It is so picturesque when a beautiful bride walks down a staircase to make a grand entrance. Brittany had a First Look with her father (don’t forget to include a first look with dad!) in the grand foyer of our historic house – such a heartwarming moment! Having so many beautiful locations to choose from, many couples share a First Look surrounded by the natural beauty of our garden. And not just between couples – but with dads and daughters, too! With several parks and historic buildings nearby our property there are plenty of other gorgeous spots for couples to choose from. We love seeing these heartwarming moments that couples share before their ceremonies. So much love! 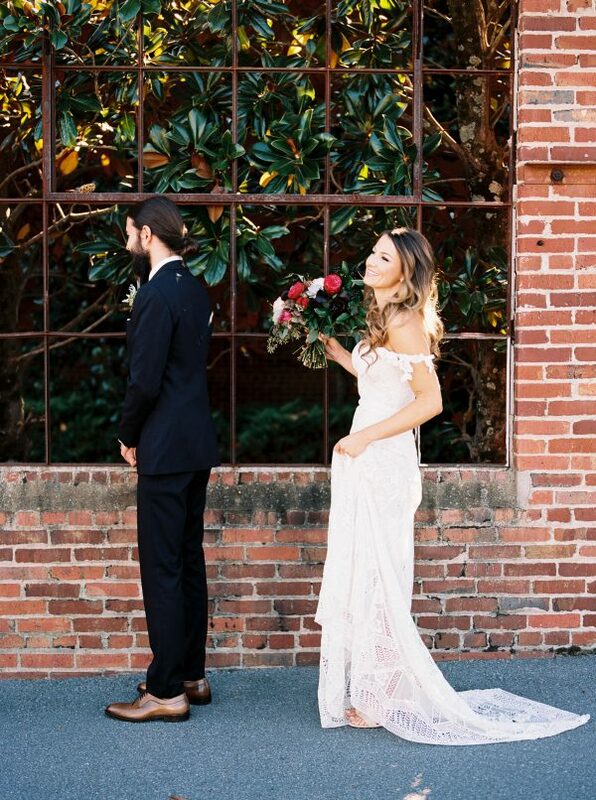 First Looks are such a romantic addition to a wedding day. The excitement that builds is so sweet, and when the couples finally lay eyes on each other it is such a beautiful and emotional moment! We can’t wait to see how more couples incorporate this new tradition into their big days.